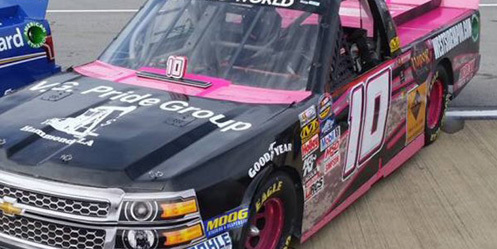 Jennifer Jo Cobb picked up the 6th last-place finish of her NASCAR Camping World Truck Series career in Saturday’s Fred’s 250 at the Talladega Superspeedway when her #10 V.G. Pride Group / Westsidevapor.com Chevrolet lost the engine after 29 of the race’s 98 laps. The finish, which came in Cobb’s 112th series start, was her second of the season and her first since Dover, 13 races ago. Since Dover, Cobb has continued to qualify for every race, picking up four more top-twenty finishes in that span. She’s also run a medley of new and returning sponsors in recent weeks, including Louisiana oilfield consulting firm V.G. Pride Group, which graced the hood. Talladega would also be the first time since Eldora in July where Cobb entered just one truck, leaving behind the “start-and-park” #0 entry driven by Caleb Roark and Adam Edwards that’s helped keep the team atop the 2015 LASTCAR Owner’s Championship. At Talladega, Cobb turned heads in practice when she climbed from 23rd in the opening session to fastest overall in Happy Hour, her best lap of 14 turned coming in at 182.965 mph. In qualifying, she had to rely on Owner Points with the 29th starting spot, but still outpaced the two drivers she needed in a rare 34-truck entry list. Missing the show were Ryan Ellis in MAKE Motorsports’ unsponsored #50 Chevrolet and two-time Whelen Southern Modified Tour champion Andy Seuss. Seuss was making his first Truck Series attempt since April 2013, when he and Rosenblum also missed the cut for that year’s race at the Rockingham Speedway. Then, as on Saturday, he was driving the #28 Chevrolet for Jim Rosenblum’s FDNY Racing, which honored the department’s 150th anniversary with help from volunteering firefighters. The 32nd starting spot went to Jordan Anderson and the #74 Rusty’s Off Road Products Chevrolet. Anderson personally drove six hours from the South Carolina State Fair to the track and qualified for his first-ever superspeedway start. Anderson climbed to 19th - his best finish since Mosport in August - one of many strong runs seen on Saturday. ARCA veteran Bobby Gerhart finished a career-best 12th in his first Truck Series start since 1996 driving a family-owned #36 Lucas Oil / MavTV / Breast Cancer Awareness Chevrolet. Billy Boat Motorsports teammates Mason Mingus (#15) and Chad Boat (#16) both cracked the Top Ten in 3rd and 9th - each their best run in a truck. And part-timer Chris Fontaine finished 8th in the #45 Glenden Enterprises / Racktail.com Toyota, just his third top-ten finish in 53 starts over nine seasons. In addition, 2011 Daytona 500 qualifier Brian Keselowski, making his first Truck start driving in relief of the injured Austin Theriault in the #29 Cooper Standard Ford owned by his brother, and last year’s ARCA at Kansas winner Spencer Gallagher in his family-prepared GMS Racing #23 Allegiant Travel Chevrolet were both in contention for the win before two unrelated misfortunes dropped them from 2nd to 17th and 18th, respectively. Meanwhile, Cobb took the last spot after her engine issues, followed six circuits later by Canadian driver Terry Jones. Jones walked away at the end of his first Truck start since 2010, even after hard contact with the inside wall off Turn 4 that destroyed his #30 Nortrax Chevrolet. 30th went to Clay Greenfield, whose #68 ClutchDefense.com Chevrolet stalled on the apron on Lap 82 and retired with overheating issues. 29th was Stanton Barrett, whose Truck Series debut and further cross-promotion with his film “Navy Seals vs. Zombies” ended when he tangled with point leader Matt Crafton in Turn 1 on Lap 87. Rounding out the Bottom Five was Daniel Hemric, who lost seven laps in total after the hood on his #14 Salvation Army / California Clean Power Chevrolet came loose in the early stages. *This is Cobb’s second last-place finish in a Truck Series race at Talladega. On October 31, 2009, her #50 Boys Racing Dodge fielded by NASCAR veteran Trevor Boys lost the engine after completing 1 lap of the Mountain Dew 250 Fueled by Fred’s. It was Cobb’s first Truck Series last-place finish and came in her fourth series start. *This is the first last-place finish by the #10 in a Truck Series race at Talladega.